Guide Posts Role of an Ahmadi (Bashir Ahmad Orchard) An Ahmadi is a Muslim who believes that Hazrat Mirza Ghulam Ahmad, the Holy Founder of the Ahmadiyya Movement in Islam, was the Promised Messiah and Mahdi whose advent had been foretold by the Holy Prophet Muhammad (peace be on him) and by earlier prophets including Jesus. Nevertheless, this is merely a theoretical acclamation and in itself is no more than a label. The Promised Messiah was a Messenger of God. He called upon all mankind to accept the truth of his divine office; but this was not all: Islam, he declared, was a practical way of life which demanded total resignation to the teachings of the Holy Quran and the Holy Prophet Muhammad (peace be on him). 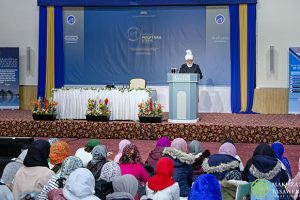 The attainment of this ideal must be the resolve and goal of every Ahmadi in whose life the principles of Islam should be manifested in every manner of living. The Promised Messiah declared: “The real object of man’s life according to the Holy Quran is, therefore, a true knowledge and worship of God and a total resignation to His Will that whatever is said or done is said or done for His sake only.” “What is Islam? It is the burning fire which consumes all low desires and, setting fire to false gods, offers our life, property and honour as a sacrifice before God.” (Philosophy of the Teaching of Islam). 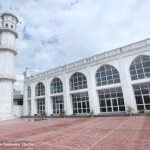 An Ahmadi is expected to demonstrate his love for God and the Holy Prophet by moulding his life in strict accordance with the teachings of Islam. He does not allow the lure of material wealth and comforts to override his spiritual obligations and responsibilities. His first and foremost thought is to regulate his conduct in accordance with the will and pleasure of God. 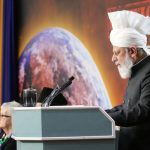 The Promised Messiah was not concerned solely in clarifying points of theoretical dispute such as the meaning of Khatamun Nabuwat, death of Jesus, Miraj, rife after death, etc. Notwithstanding the importance of these GUIDE POSTS 3 subjects the ultimate purpose of his mission was the reformation of mankind through the recognition and resignation to Islam. The distinctive characteristic of an Ahmadi should be his undivided and consummated attachment to Islam; and this devotion should control his life to such an extent that the slightest deviation from God’s laws is abhorrent to him. The Promised Messiah stated that if there is as much as an atom’s weight of worldliness in the behaviour of an Ahmadi then he cannot be counted as his true follower. That is to say no law or principle of Islam should be trampled upon or neglected in order to satisfy some worldly interests or inclinations. 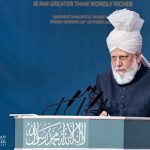 An Ahmadi is expected to reflect not only the basic teachings of Islam but also the finer aspects of faith which others may overlook as unimportant. An Ahmadi is: 1. A soldier of Islam. 2. An ambassador of Islam. 3. A preacher of Islam. 4. A servant of Islam. 5. A defender of Islam. 6. An embodiment of Islam. Soldier of Islam A soldier has many traits. Among them is his ability to serve and fight under the most hazardous conditions. He exerts his energies to the full for his flag and country. An Ahmadi is a soldier of God dedicated to the flag of Islam and the fight for the defence and propagation of his faith through peaceful means. As a soldier he is not a sit-at-home Muslim. He goes forth in all directions wielding his spiritual sword. He is not deterred by the heat of the sun, snow and icy winds, downpours of rain or other discomforts when beckoned by the call of duty. The readiness to undergo severe hardships for the love of Islam is a sign and test of true faith. An Ahmadi takes inspiration from the great lives of those who have gone down in history as pioneers and stalwarts of glory. He is anxious to imbibe and cultivate their inspiring qualities in order to enable him to fight more effectively for Islam. 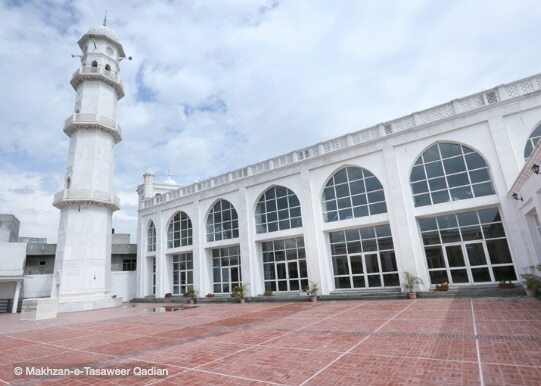 Ambassador of Islam An Ahmadi has a grave and privileged responsibility for he is a representative of the Promised Messiah whose advent in the latter days had been foretold by the Holy Prophet of Islam. 4 REVIEW OF RELIGIONS The Promised Messiah entreated his followeTS to be practical Muslims in every detail. An Ahmadi should be a worthy ambassador of Islam and enthusiastically endeavour to adhere to all its teachings. It has truly been said that faith without works is dead. Knowing this an Ahmadi endeavours to be meticulous in living up to the teachings of Ahmadiyyat (True Islam). The eyes of the world are upon him; but of greater consequence is the fact that the eyes of God are also upon him. An ambassador faithfully symbolises the government which he represents; so must an Ahmadi faithfully symbolise the teachings he represents. Preacher of Islam The Holy Prophet Muhammad (may peace be on him) was a prophet of God commissioned with a Divine message for all mankind. It is incumbent upon every Muslim to preach his faith to others; also, when the occasion arises, to guide and advise his own Muslim brothers. Thus in the Holy Quran Muslims are enjoined to exhort one another to truth. 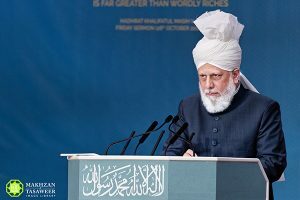 The Ahmadiyya Movement works to convey and expound the message of Islam to everybody and to hasten the coming of the day when Islam will be the dominant faith of the world. An Ahmadi is a missionary of Islam. He preaches to all and sundry; and in order to do this successfully he must practise what he preaches. This he well knows because it is the epitome of Quranic teaching and so becomes the most necessary of all requirements in the mission field. Servants of Islam An Ahmadi is a servant of God. A good servant is imbued with two outstanding qualities: 1. He is respectful. 2. He is obedient. Respect for God and his creatures is an essential aspect of the Islamic faith. God is the Master of masters worthy only of the highest respect and love. 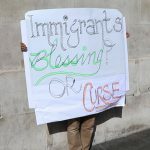 The creatures of God are the creation of God and must, therefore, be given due respect. Being a servant of God an Ahmadi is obedient to God. He is extremely careful in observing the commandments of God and ever watchful in avoiding His displeasure. He is regular in namaz and observes those fasts required by law. He pays zakat and other dues required by Islamic law. He also contributes in accordance with instructions and recommendations of the Promised Messiah and Khalifas. He completely shuns gambling, dancing, GUIDE POSTS. 5 wine, pork, lending money on interest, lying backbiting, cheating and other forbidden things. Obedience to God is always his watchword. Defender of Islam Islam is assailed on all sides by its adversaries who through ignorance or prejudice endeavour to smear the fair name of Islam. Islam is, perhaps, the most misrepresented faith. An Ahmadi educates himself in Islam not only for his own guidance and upliftment but also that he may be able to defend Islam against it’s critics. It is asserted that Islam is a man made religion bereft of true spiritual values. 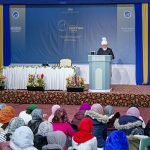 On the contrary Ahmadi illustrates in his own life that Islam is a living religion which can beautify and purify the soul and character of a person. An Ahmadi strives to build an exemplary character for this more than anything else is able to prove the spiritual efficacy of Islam. An Ahmadi defends Islam best by living Islam. Embodiment of Islam An Ahmadi is a Muslim whose mind has been opened to wonderful spiritual truths which remain hidden to others. These truths have impressed themselves so deeply upon him that he finds his only solace in the bosom of God. Being human he possesses natural attachments of love for his family, relatives and friends; but despite the ardour of these relationships he never forgets his loyalty to God. When an Ahmadi has become in the true sense a soldier, ambassador, preacher, servant and defender of Islam then, and then alone, does he blossom into an embodiment of Islam whereupon, according to the Promised Messiah: “God becomes his eye with which he sees, his tongue with which he speaks, his hand with which he repels attack, his ear with which he hears, and his foot with which he walks.” (Philosophy of the Teachings of Islam).